It’s good when people read your blog and put a “like” below a post. It’s even better when readers put a nice comment too. 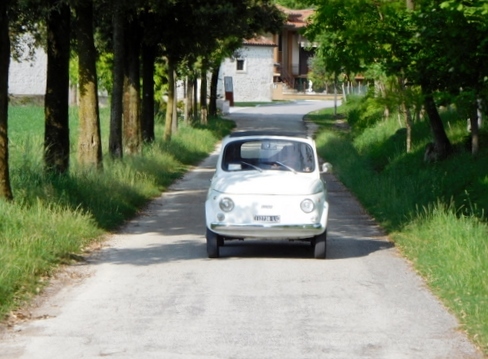 and where we entered, quite by accident, into one of the most beautiful abandoned palazzi we’ve ever seen in Italy. Maurizio Bardi is a writer, journalist and publisher, passionate about saving Italy’s beautiful neglected princesses of palaces from complete neglect and decay. We consider ourselves privileged that he wrote this short story after reading our post. 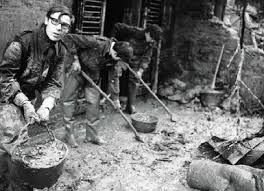 It’s not just a ghost story or a fairy tale: it also carries a particularly strong punch regarding some local political situations in present day Pontremoli. We’ve translated his evocative Italian prose into English. Thank you Maurizio! Read on and enjoy. They visited Pontremoli. 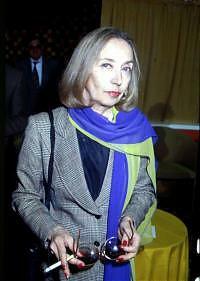 They entered into the Palazzo Damiani. They took some photographs and asked themselves some questions. Then they posted their thoughts on their internet blog. And if Alexandra and Francis were ghosts returned in search of their home after nearly three hundred years? Maybe…, Everything else, however, is true, including the history of the theatre curtain. 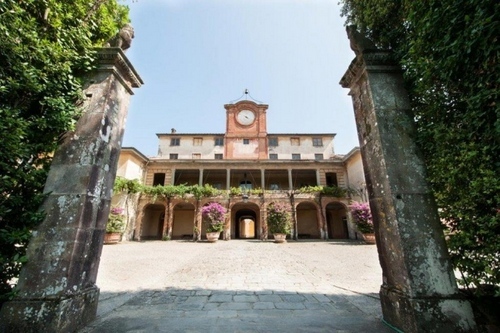 On July 11, 2014 an English couple, Alexandra and Francis, on a visit to Pontremoli, entered by chance into Palazzo Damiani and published their disenchanted thoughts on the internet. This event inspired the following short story. We felt a great wish to return to our room, in our building. 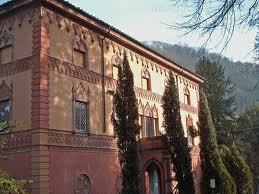 Dozens of palaces, monuments of great beauty sited between two rivers, were built in eighteenth century Pontremoli. Our building is open and unattended. Outside in the street some young people playing football, a strange game involving kicking a ball, shout and break the silence. They upset us. Farther along the horn of an iron wagon they now call a car is booming. Nearly three centuries have passed. Why has the pleasure of silence disappeared? We are no longer able to listen. Where are those friends who frequented our palace, those intelligent souls who told us about new ideas from Paris, who spoke about the Enlightenment wandering from one place to another? 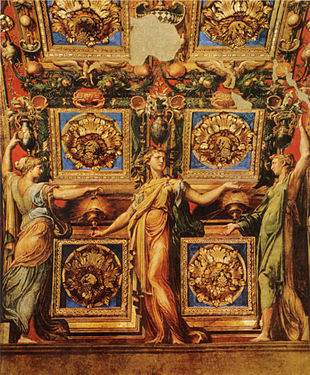 Did they disappear along with Nicolò Contestabili’s frescoes, along with the collapsing walls and windows, along with our conversations in front of the fireplace? We look for our room in the twilight. Its alcove is crumbling. The frescoed ceiling is collapsing. The walls and the plaster are collapsing. The world is collapsing. How painful! Even we, ghosts, grieve and suffer! Francis is lost. 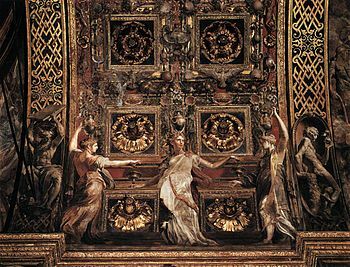 Pleasure, which was the basis of his philosophy of a carefree and light-hearted life, has been stolen from him; that philosophy emanating from the works of Natali and Contestabili, those eighteenth century painters who gave Pontremoli its splendour. “What can we do?” Francis asks Alexandra. Francis’s voice saddened: “Do you remember our wonderful theatre by the river, the Rose Theatre, also built with funds from our family? They renewed it. It was he, the master builder, who was works-manager. I was happy, so I went to have a look. 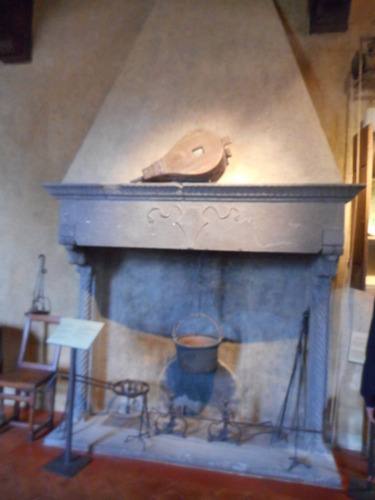 I looked for the terracotta floors hand-made with Terrarossa clay. I looked for the walnut doors of the master carpenters behind which we hid during the festivals. I looked for the painting before which guests arriving at the theatre remained enchanted. They are no longer there. Now they are elsewhere. But where? Perched on the alcove railing, exhausted, Alexandra falls asleep. I gaze out of the window that looks over what was once a small pleasant, gentle garden surrounded by arches and think about our longing, our desire to create a world which is, however, beyond that barrier that we ghosts cannot surmount. Then, suddenly, as if it is resurrection night for ghosts, she confronts him: “Francis, wake up! There’s no time to lose, you must tell. It’s true we are ghosts, but with the internet we ghosts can become something else! A sanctuary is a place of safety. 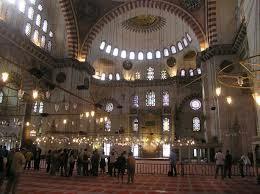 Traditionally, one can seek sanctuary from an enemy by sheltering in the sacred precincts of a religious building. Today, unfortunately as world events have shown, such places are no guarantee of safety at all. A sanctuary is also a place associated with a saint. 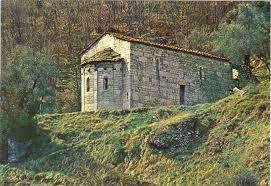 Italy is a country of saints and sanctuaries proliferate. 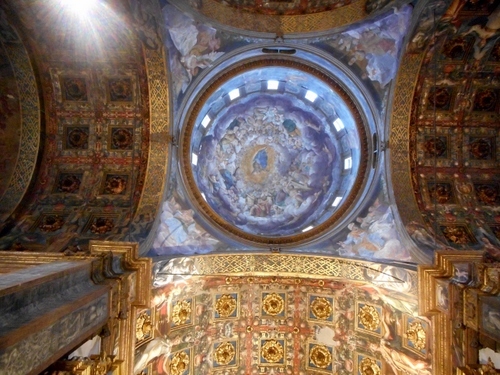 Lucca, for example, has its sanctuary dedicated to Saint Gemma (see my post at https://longoio.wordpress.com/2013/04/10/saint-gemma-galgani-mystic-saint-or-mental-patient/ ). Often sanctuaries are larger and more imposing buildings than cathedrals. 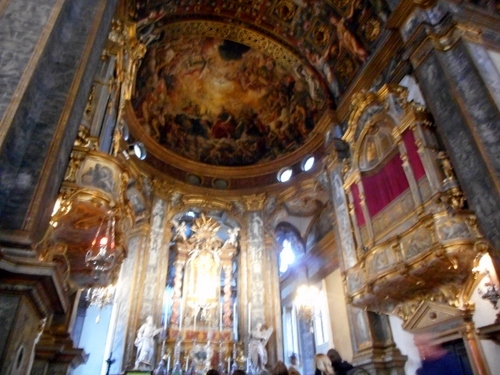 In Padua the extraordinary sanctuary dedicated to Saint Anthony (see my post at https://longoio.wordpress.com/2014/05/13/the-saint-of-lost-causes/) dominates the town in a way that the Duomo does not. but coming a close second is the beautiful sanctuary of Santa Maria della Steccata (literally Saint Mary of the stockade) which I had missed out on the previous visit but was now able to see last week-end. A basilica is, literally, ‘the house of the king’ and, thus, of the Lord. Its name derives from Greek ‘Basileus’ which signifies king and from ‘oikos’ which means house. Every church could thus be defined as a basilica but the Roman Catholic Church only gives to some the title of basilica (which could be a minor or major one) depending on their importance and artistic value. A basilica, furthermore must be able maintain the correct decorum in the practise of its religious rites. A Duomo, from Latin ‘Domus’ meaning house, still remains the house of God and is the most important church in a town or city. It’s usually originally built in gothic style with a firm emphasis on the vertical – aspirations going heavenwards. 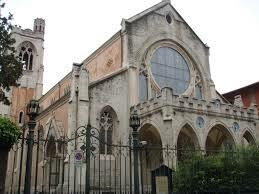 A cattedrale (cathedral) is a Duomo located in a town or city which is also the seat of a bishop. In fact, the name cattedrale comes from Latin ‘cathedra’ meaning a throne – for that’s where the bishop has his seat. The Basilica of Santa Maria della Steccata, from 1718 the seat of the Constantinian Order of St. George (which is supposed to date back to its founding by the Roman Emperor Constantine) was constructed between 1521 and 1539 and in 2008 elevated to the rank of minor basilica. So it’s both a sanctuary and a basilica but not a duomo or cattedrale. I hope that explains it now! 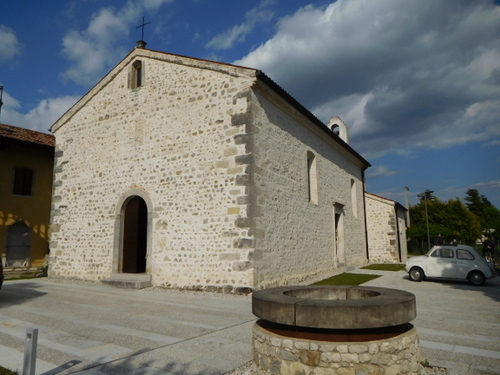 On the site of the present church a religious building existed since 1392 and an oratory was built to house a venerated image of St. John the Baptist painted in fresco on the outer wall of a house. The building became home to a brotherhood dedicated to the Virgin of the Annunciation and engaged in the distribution of dowries for poor girls and unmarried women who lacked paternal protection. Towards the end of the fourteenth century a picture of the Madonna nursing the baby Jesus on the facade of the oratory was painted. This image soon became the object of special devotion on the part of the people of Parma Since the area of ​​the building was protected by a fence, erected perhaps to control the flow of pilgrims, the Virgin began to be invoked under the title of ‘Our Lady of the Steccata’ (stockade). 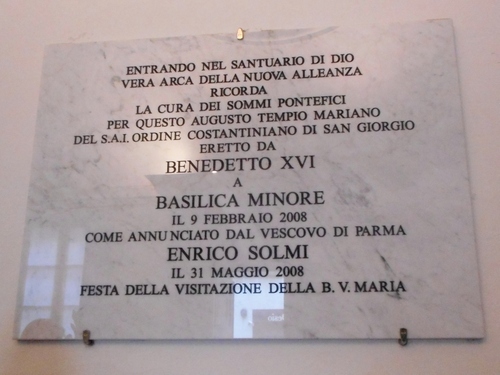 The church was consecrated on February 24, 1539 by Cardinal Ciocchi Gian Maria del Monte, papal legate of the duchies of Parma and Piacenza. 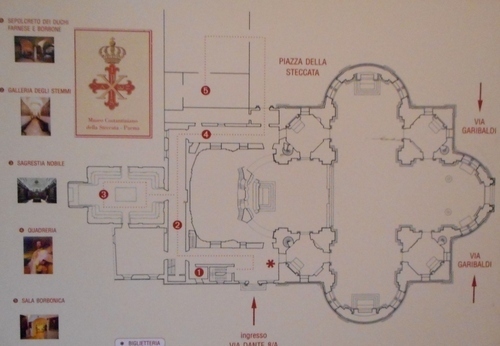 The building’s plan is a Greek cross, with transepts placed on the cardinal axes. 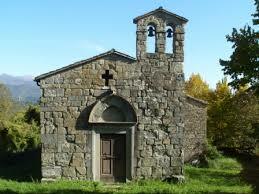 Between the cross’s arms there are four quadrangular chapels. The church is, indeed, very similar to the original plan for Saint Peter’s in Rome before Maderna changed that building’s Michaelangeloesque plan into the more generally accepted Latin cross, with a long nave better suited to liturgical purposes. and the three foolish virgins. 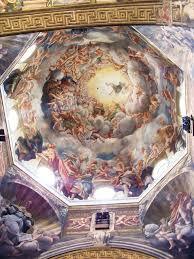 and Bernardino Gatti, who painted the Assumption of Mary in the dome. The interior is permeated with a rich and mystic atmosphere intensified by the arrival of many pilgrims while I was there. It’s pure frozen music and would, in fact, make a wonderful ambience for such works as Palestrina’s polyphonic masses. 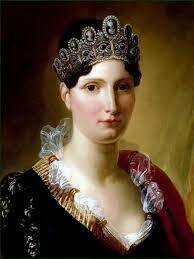 for Maria Luigia was herself a member of this great Austrian dynasty of the Hapsburgs. The basilica has two magnificent organs. 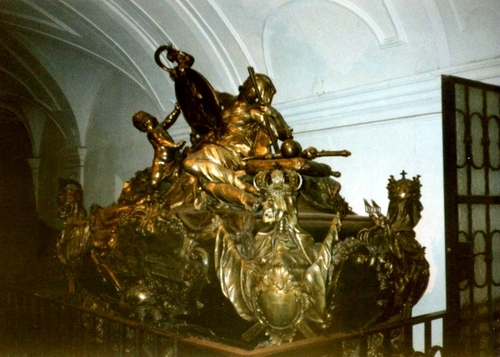 The Antegnati organ dates back to 1574. The Antegnati were a Brescian family of organ builders who were active between the end of the fifteenth and the start of the eighteenth century. The organ was restored in 1778 by Antonio Negri Poncini and again by the now defunct Tamburini firm of organ builders in 1970. The second organ was built by Carlo Vegezzi-Bossi in 1892 and restored in 1940, again by Tamburini. It would be fantastic to hear these organs. Next visit perhaps? 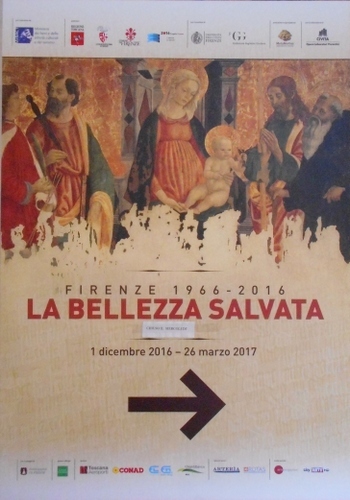 A trip from Bagni di Lucca to see a show in Florence should, of course, always be combined with other activities to make a proper day of it in the “City of the Lily”. The weather was not brilliant when we went there and a walk-about, window-shopping and people-watching, was combined with a visit to three museums and some churches. Florence museums, indeed Italian museums in general, are quite compact and it’s possible to visit most of them comfortably within a couple of hours each. 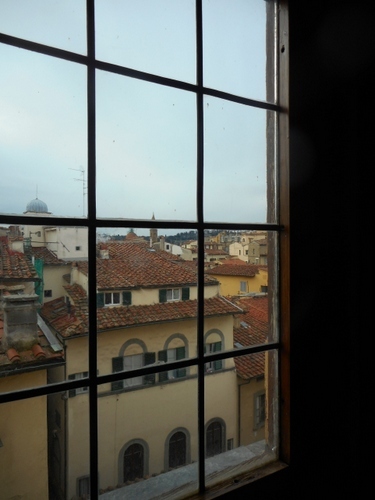 If one wants to see how aristocratic families lived in mediaeval and early renaissance Florence then the palazzo Davanzati, which houses the Museo della Casa Fiorentina, is an absolute must. It’s very well presented and its rooms are not just beautifully decorated but also full of interesting paintings, sculptures, furniture and household items. For a long time the palazzo was under restoration. It partly re-opened in 2005, and fully so in 2009. The living quarters are distributed on three floors. 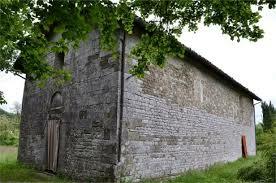 The highlight of each floor is a large hall (Sala madornale) which could be used for dining or dancing. The kitchen is on the top floor; a very sensible idea since it meant that cookery smells didn’t have to rise up from below. There is also an exquisite lace display section. 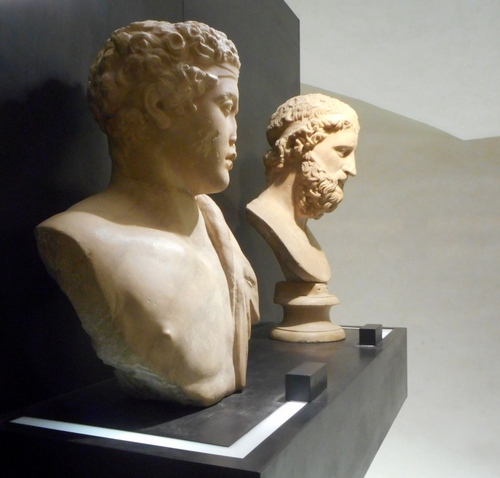 The works of art are not incredibly special but they all fit in most harmoniously in the museum’s setting. I did, however, find some items rather beautiful. 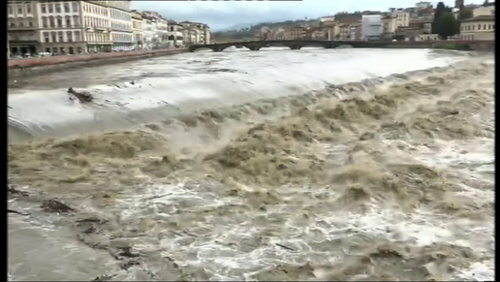 This was a lovely start to our brief visit to Florence. We should be grateful to the antiquarian Elia Volpi who purchased and restored the Palazzo Davanzati and allowed it to be open to the public way back in 1910. 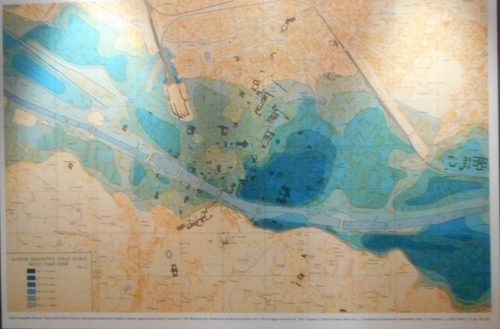 A Mosque for Florence / Una Moschea per Firenze? With 30,000 people of the Muslim faith in the Florence area and with an overcrowded makeshift mosque in Borgo Allegri just behind Santa Croce, there clearly is a demand for a purpose-built place of worship for this ever-expanding community. Florence has been open to different faiths and different variations of the same faith for some time since the enlightenment hit it in the eighteenth century and it became the first country (as a grand-duchy) in the world to abolish capital punishment. For example there is this fairy-tale Russian Orthodox Church just north of the great viali that replaced the walls in the 19th century. 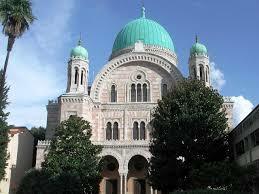 There is a majestic synagogue near Piazza d’Azeglio. 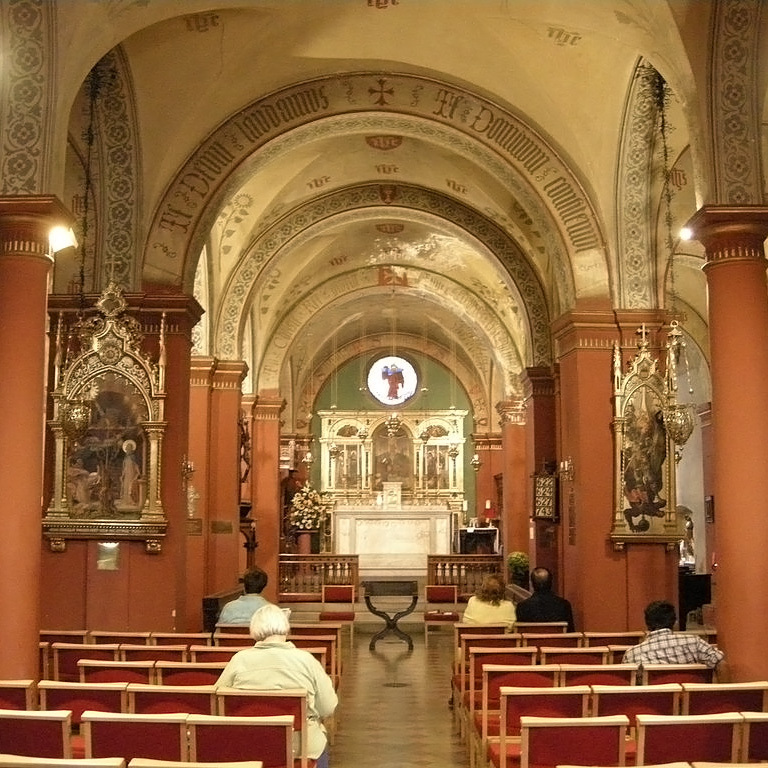 The Anglican Church in Via Maggio (which is under the diocese of Gibraltar) has been here for well over a hundred years. 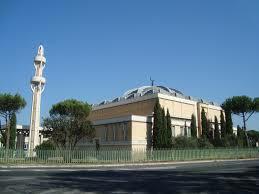 The centre of Roman Catholicism, Rome, has, of course had its own mosque since 1995. Financed by Saudi Arabia I feel there should have also been an agreement for a cathedral to be built in that country which has now awarded 1,000 lashes (increased from 600 on appeal), ten years’ imprisonment (increased from 7, again on appeal) and a hefty fine to one of its journalists, Raif Badawi, for writing a blog to express his views. So why shouldn’t Florence get its own mosque? I am not here to put my own viewpoint to these questions but just to state that many Italian Muslims have posted the following message “Non nel mio nome” (not in my name) on Facebook. Those who have suffered the most from what actually is terrorism, justifying itself by a distorted take on another monotheistic religion, are those who practise that very religion. 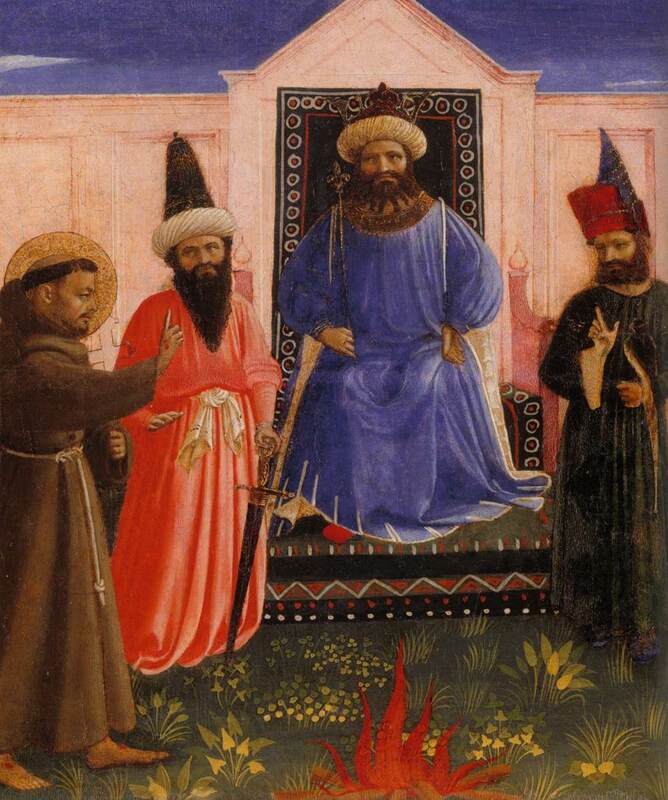 The fact is that Islam is six hundred years younger than Christianity and if we go back six hundred years (or even rather less than that) we see not only the battles of the reformation and counter-reformation but also one of the bloodiest wars ever fought in the western world, the Thirty Years war – to say nothing about the forced “latinization” of Central and South America by the conquistadores, compared with which the threatened conversion of “Europa” into “Eurabia”, as prophesised by that great world correspondent, who hailed from Florence, Oriana Fallaci, (and who in a 2006 interview in “La Repubblica” said “”Se è vicino casa mia, prendo l’esplosivo e la faccio saltare”), seems minimal. Or does it? Florence’s then-mayor, Renzi, has promised that the Islamic community will get its mosque and four possible sites for it have been ear-marked. Consultations between religious leaders and the local community have gone ahead in a spirit of cooperation and without too much “voice raising”. So will these recent tragic events jeopardize the whole Florence project or will a minaret rise up among the campanili, towers and cupolas of Florence? Not quite. Looking at the artist’s impressions of the project I see a campanile, or rather a minaret disguised as a campanile in the new mosque, somewhat on the lines that the Victorians loved to disguise their railway stations as mock-gothic castles. Moreover, I see a lovely Alberti-like façade to the whole endeavour. True, the main features of a mosque are there: the outer courtyard, the liturgical washing facilities, the abstract, or calligraphic, nature of the decoration and, clearly, the simplicity of the prayer hall and the orientation of its mehrab, but the overall picture seems harmless enough and could even enter as one of Florence’s new tourist attractions, rather like the Regent’s Park mosque does in London. Indeed, Bagni di Lucca has its own version of “religious disguise” in the Chiesa Anglicana which was designed to look like a mansion with gothick decorations and not called a church at all but a “palazzo degli Inglesi” so as not to offend Roman Catholic sensibilities when it was built in 1840. Furthermore, the classic mosque design, itself is based on a Christian byzantine model, that of Hagia Sophia in former Constantinople, now Istanbul. Even when it comes to an iconic Muslim mosque-tomb like India’s Taj Mahal an Italian architect, Geronimo Veroneo, from Venice (a city whose own cathedral is orientalesque in inspiration) headed the design project (as Italian architects were also involved in Iran’s great square of Isfahan.) 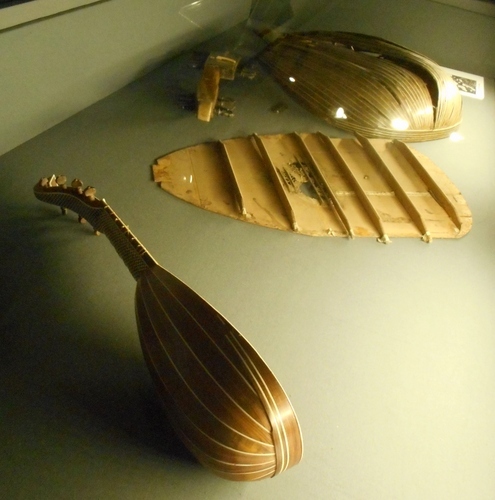 Globalization, at least in artistic spheres, has been around for a long time! My hope is that there will not be a backlash or a rise in fanatic Christian movements to counter what is not Islamic ideology but just despicable barbarism and an incarnation of absolutist intolerance; I would find the idea of Methodist suicide-bombers risible and I am sure that, with the firm backing of all western leaders and the presence of a Pope named after St. Francis (who himself entered into a dialogue with the Mohammedan Soldan of the Caliphate of Egypt in the twelfth century), our civilization will not be saved by the skin of its teeth (as Sir Kenneth Clark so aptly described the re-emergence of European values after the barbaric invasions) but by the centuries-old tradition weaved by thoughts of great men (and women) that have illuminated even the darkest periods of our, certainly not blameless, history. A blog is nothing without feedback. Any comment is most welcome!